Not familiar with transitional style? 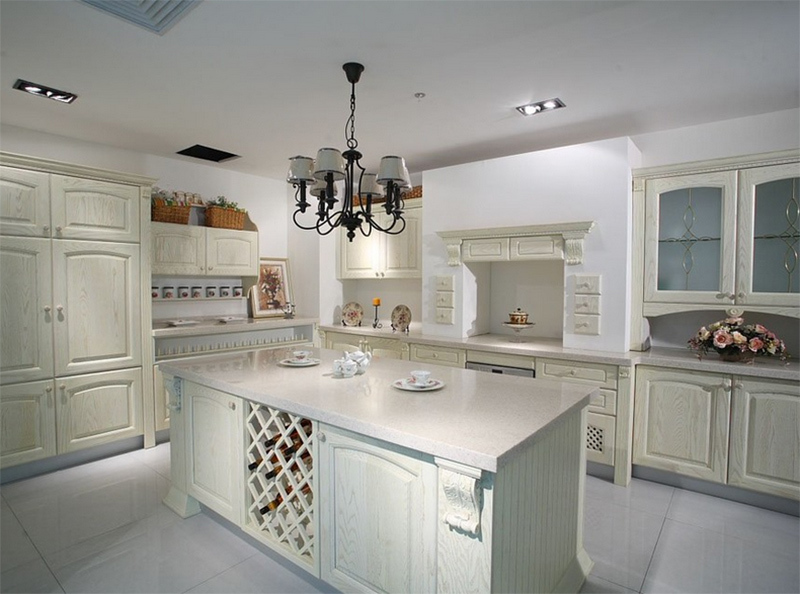 Here is a list of kitchens that will give you an idea. 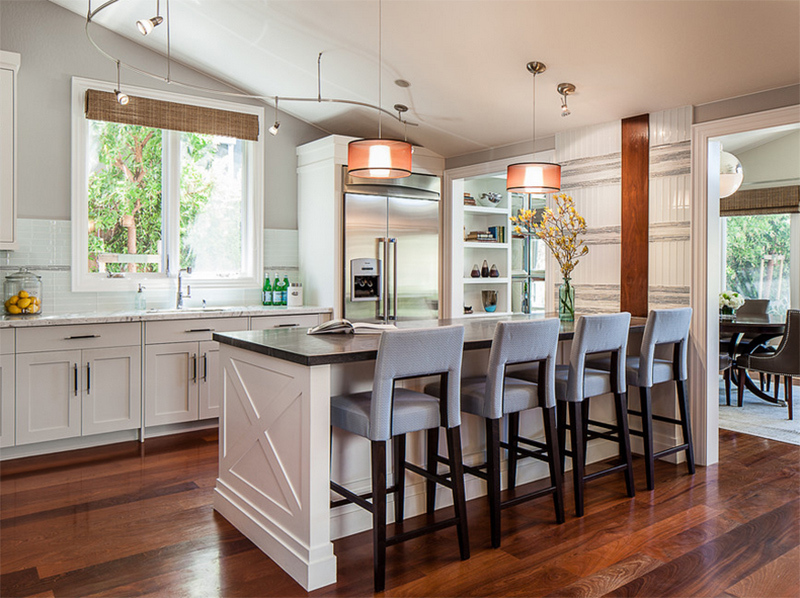 Have you heard of a transitional space? Well, if not, let me tell you what it is. When you say transitional, it is a combination of traditional and contemporary style. Or it is mostly referred to as an “updated classic” style or a classic space with an added contemporary twist. To make the long story short, it is a new take on traditional spaces. This can be done easily especially if your home has a classic design merely by bringing in contemporary items inside the home. We can use this style even in the kitchen. In this style, furniture has clean, timeless and classic design which focuses more on comfort and practicality. It doesn’t use complex design or ornamentation. Rather, it prefers to use minimal decors to create a relaxing and comfortable area without overdoing it. When we speak of color palettes, it would be monochromatic with some artistic accents. Wood finishing is one notable feature too. 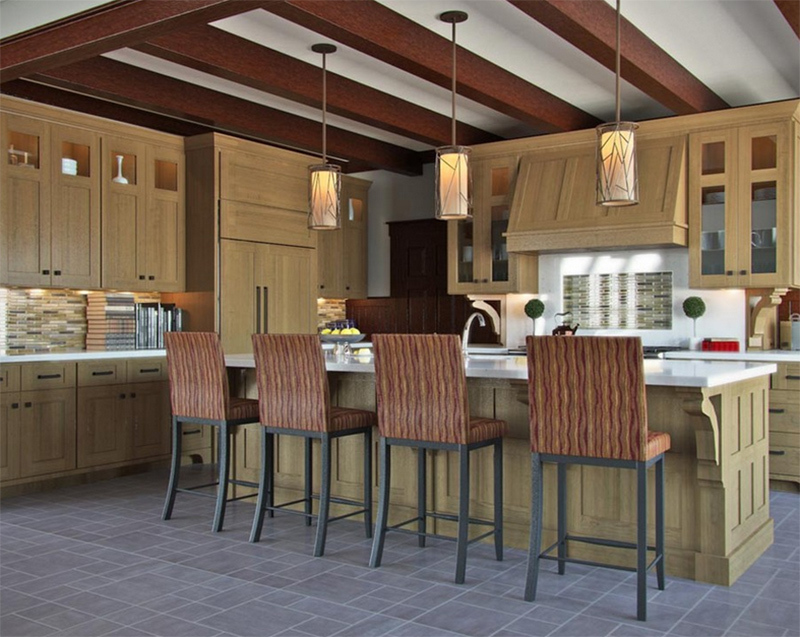 Let us take a look at some transitional kitchens we have gathered for today’s feature. The lighting has a huge impact to this kitchen as well as the chairs too that adds a contemporary touch to this traditional space. 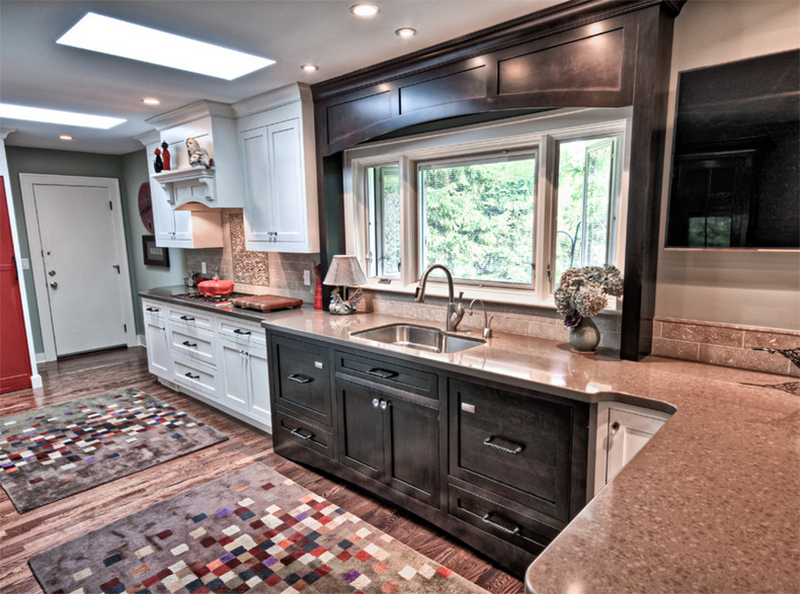 A simple transitional kitchen that shows how you can layout a kitchen with a square island. Note the addition of plants in the area. 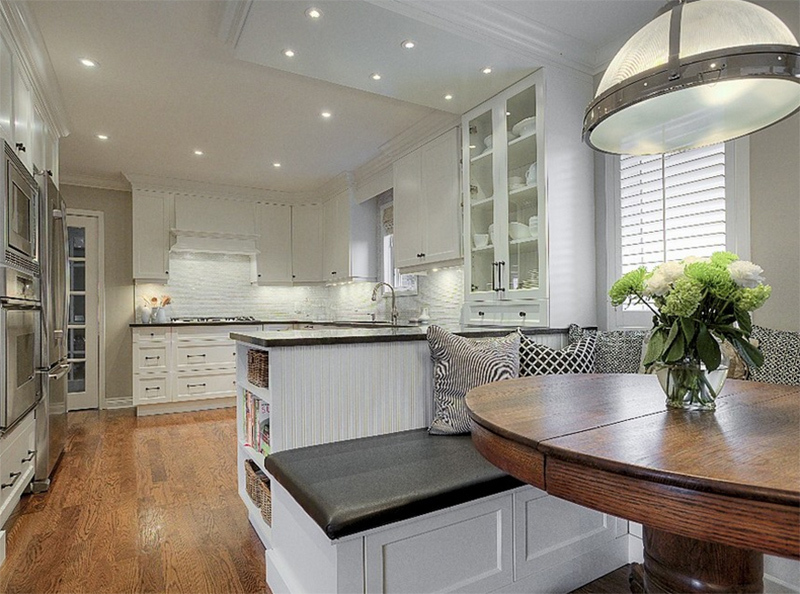 The chairs in the kitchen have some texture in it that adds an interesting depth to the space. The design of the pendant lights look nice too. 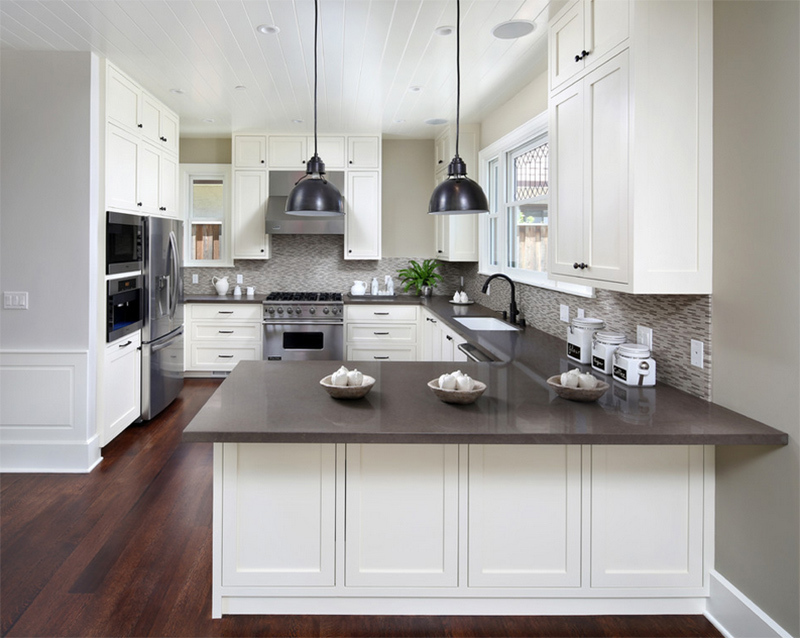 A full kitchen remodel is seen here with white cabinets, waterfall caesarstone countertop, hardwood floors with oil finish. 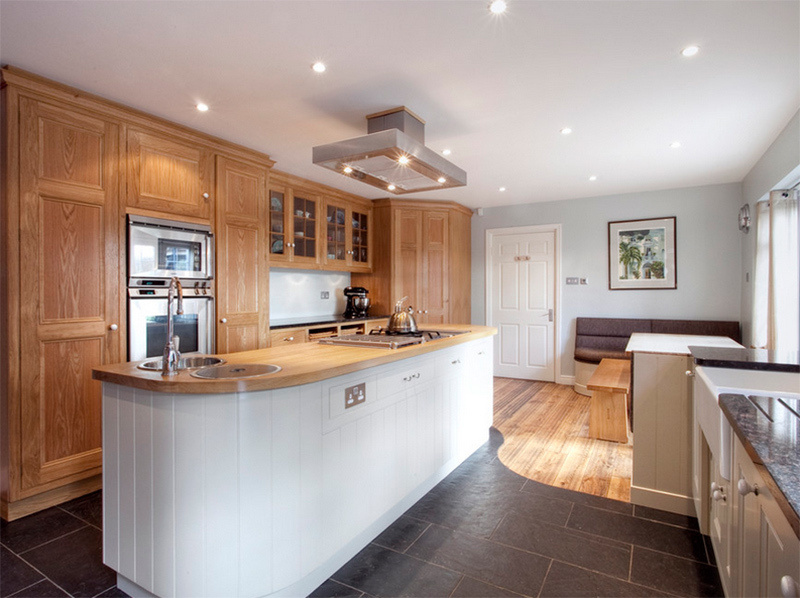 Such a grand and sophisticated kitchen indeed from the ceiling lights to the extended design of the kitchen island. Love the wallpaper? 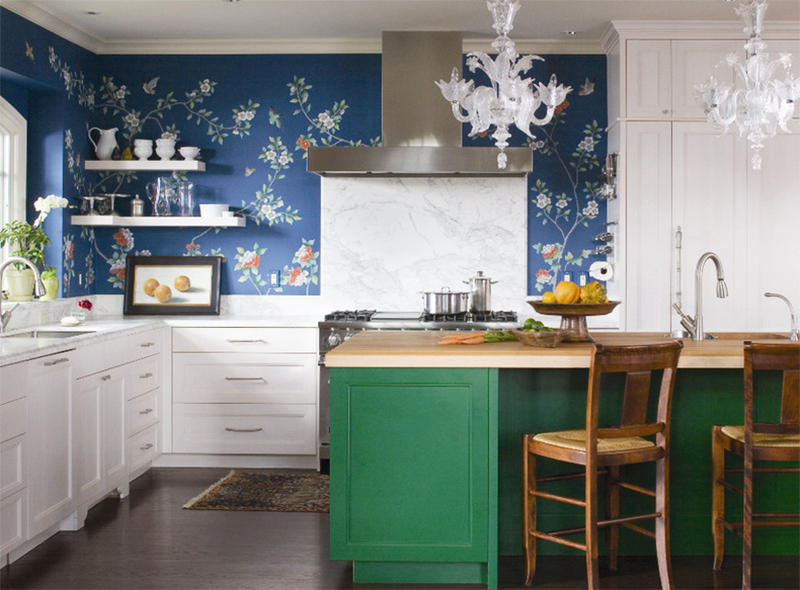 Well, you can notice that aside from the blue wallpaper, the kitchen island is painted green to match it. And for sure, your eyes were drawn to the crystal chandeliers as well. 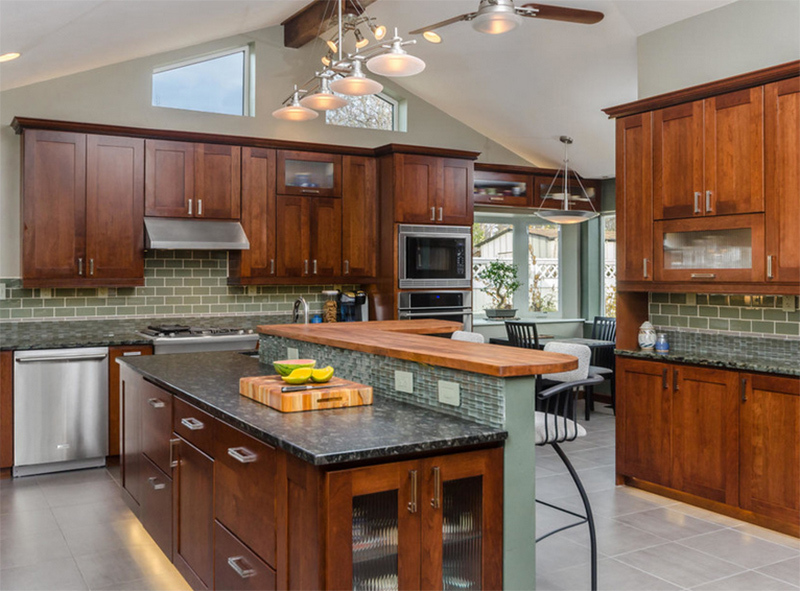 Isn’t it interesting to see a kitchen island shapes like this? Well it sure is rare especially for a transitional space. 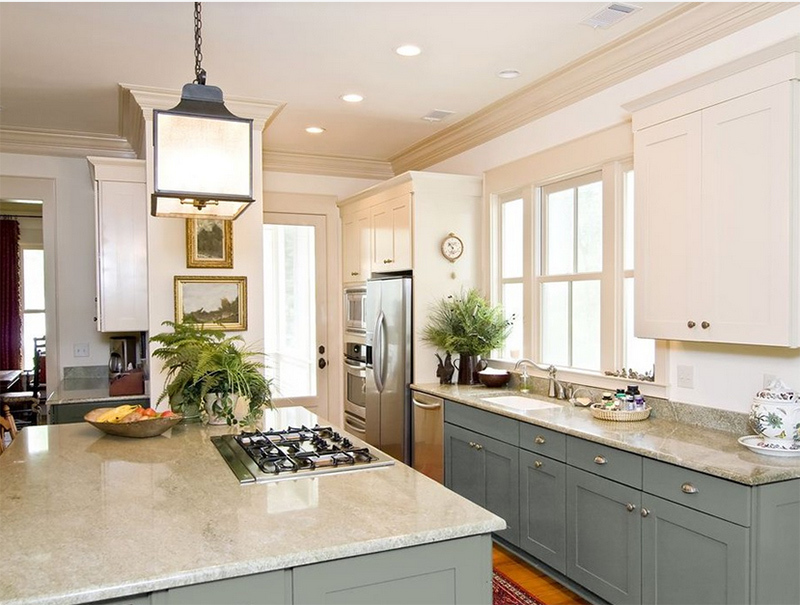 Combine white and dark gray for a kitchen and you’ll never go wrong. Aside from the decorative grill on the window, the industrial lights and backsplash are lovely too. The range hood is made from a reclaimed warehouse beam, finished with a copper top and placed on stone and glass mosaic tile- nice idea, right? 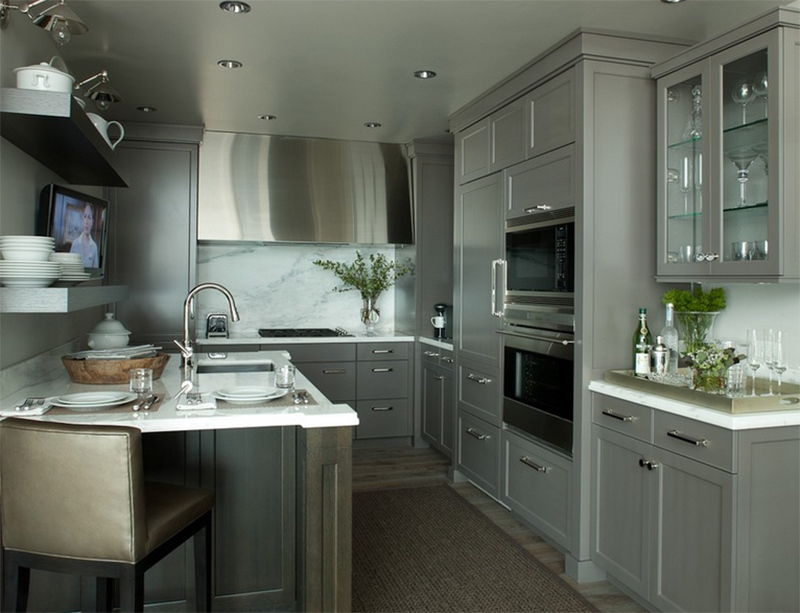 This kitchen is a bit dark because of the use of gray colors but it does look pretty nice especially with the stainless features. 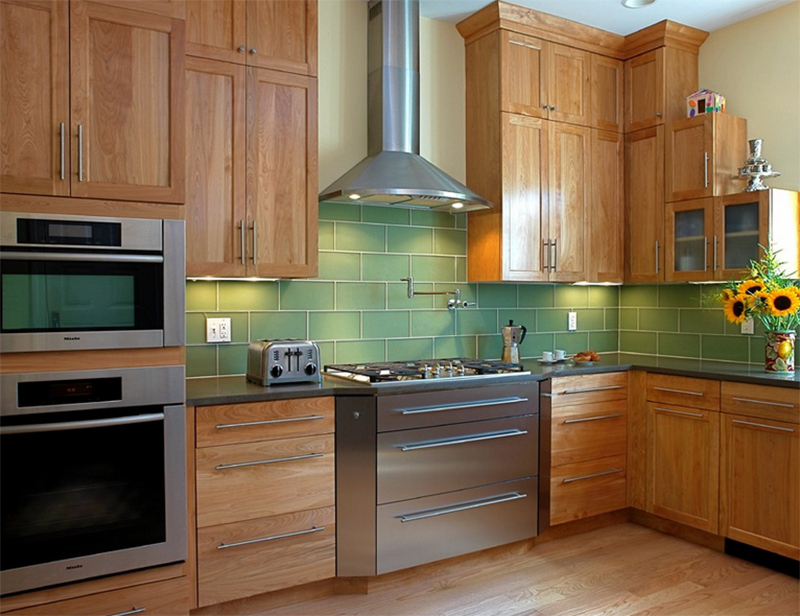 The combination of green and wood seems to bring nature into this kitchen with high ceilings and beautiful lighting. 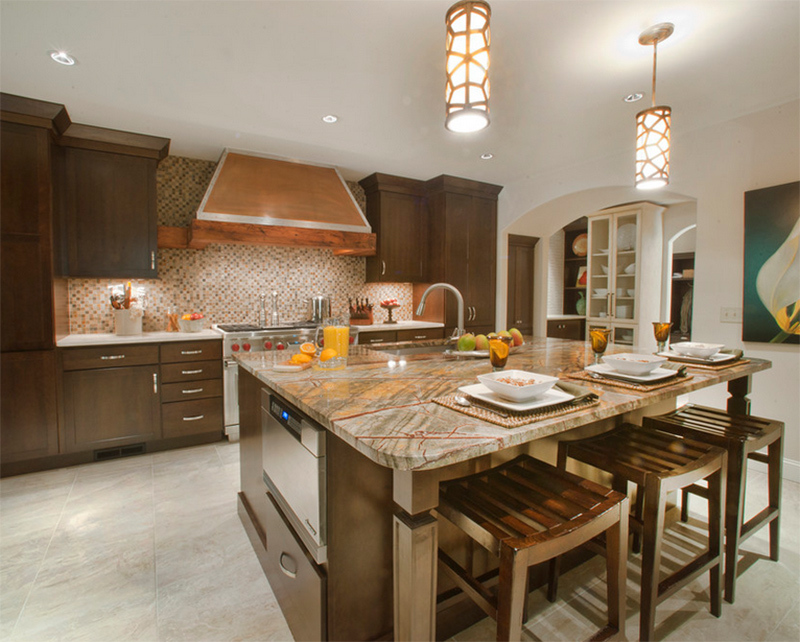 I like the tile work on the kitchen island too. I am not a fan of the facade of these cabinets but it does look unique and interesting. What can you say? There is a subtle traditional feel here but I can sense the contemporary style even more and yes, when put together, a transitional look is achieved. 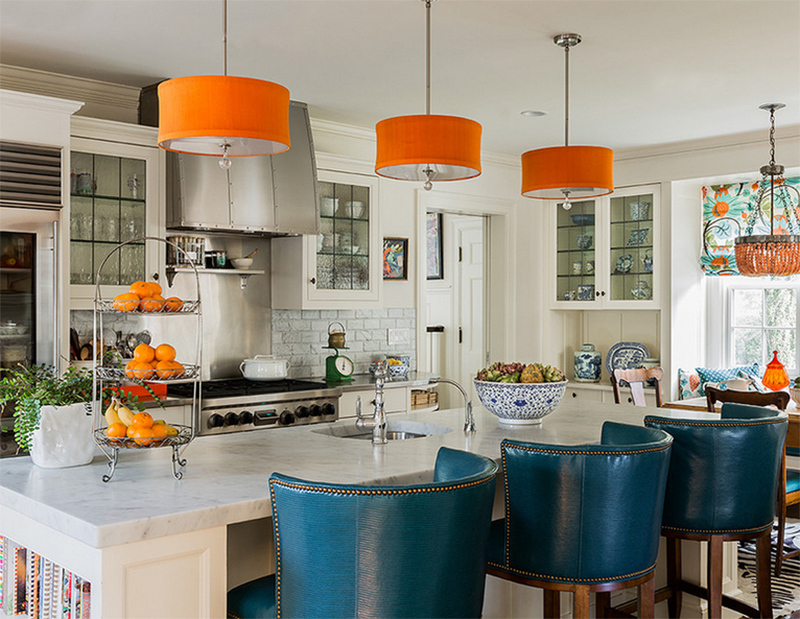 How about a fusion of blue greens and oranges for a transitional kitchen? Well, why not? 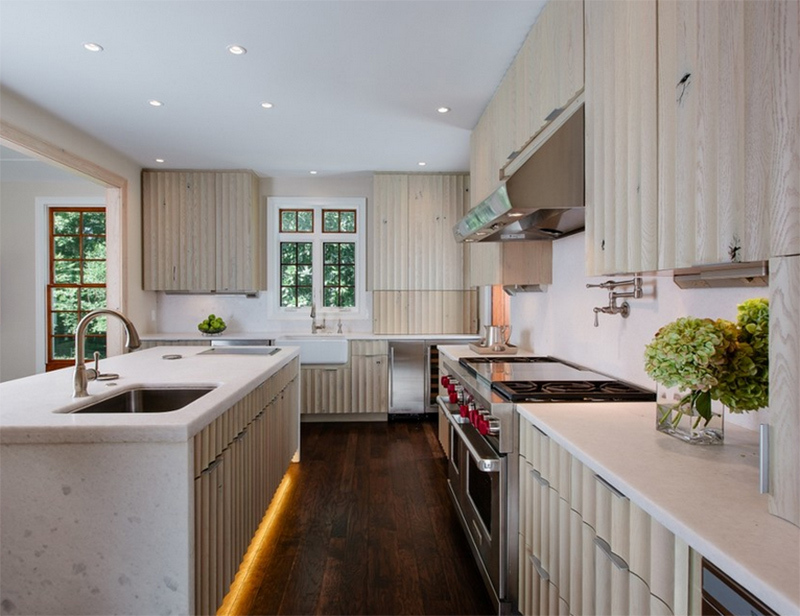 What I like in this kitchen, aside from the many storage spaces is the egg-like pendant lights, very unique indeed! 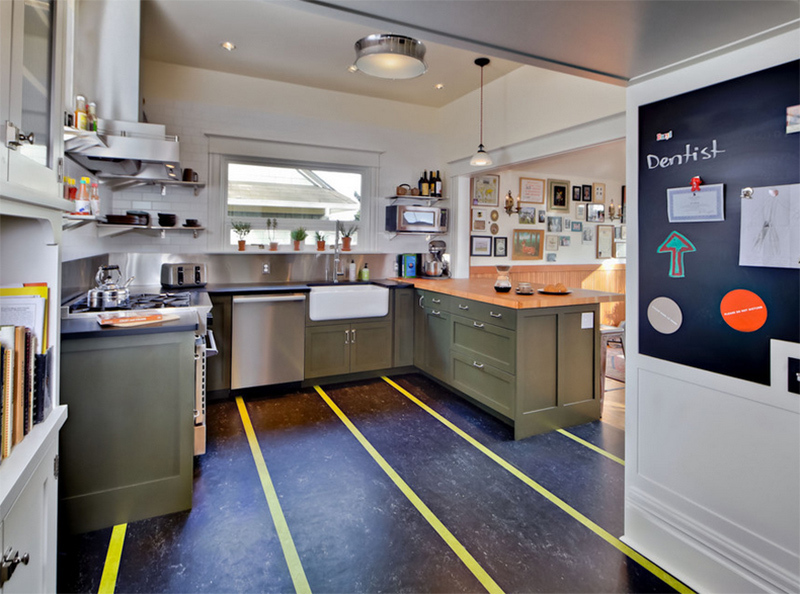 The yellow lines on the floor bring some interesting touch into this transitional kitchen. It is a cute idea to add plants on the kitchen window. 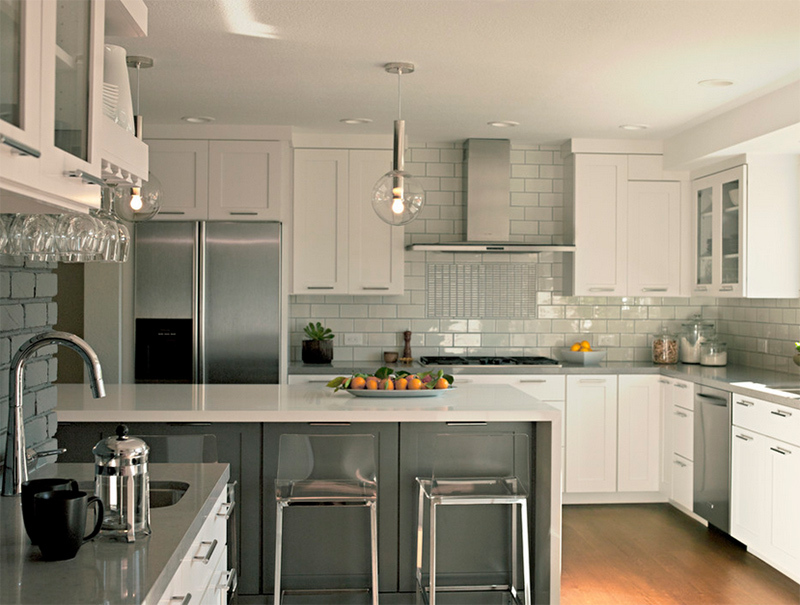 White and black is the color scheme of this kitchen with white cabinets all over and an industrial looking light. 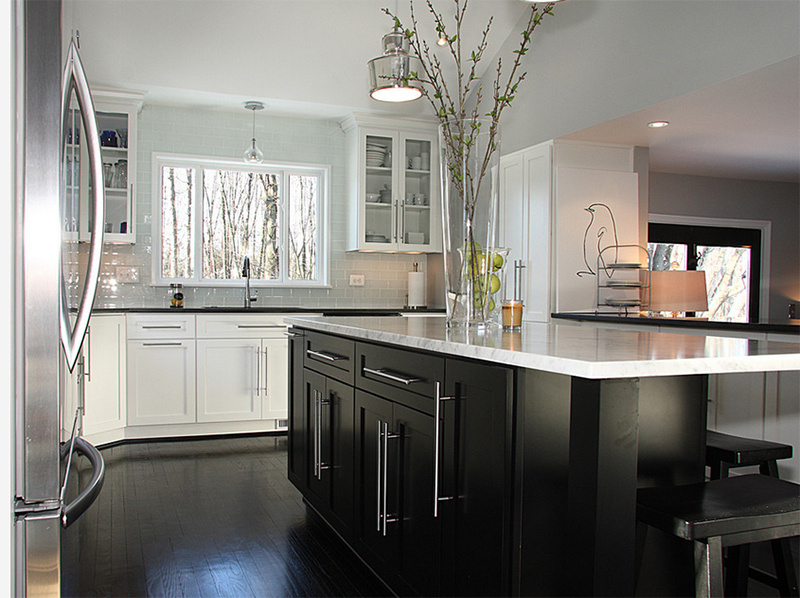 The area rug brought some life and creativity into this kitchen that has white and black cabinets in it. Great contrast, right? 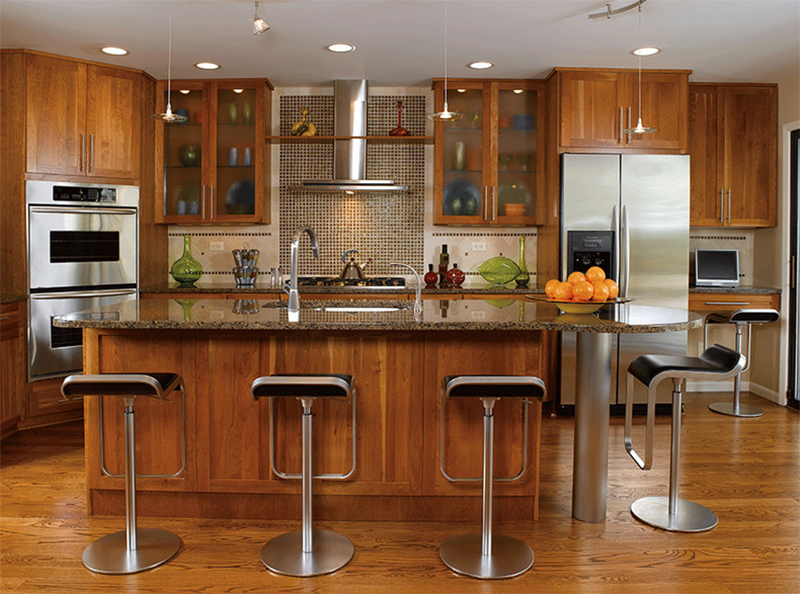 Modern high counter stools paired with a marble countertop and a kitchen island with a curvy design. Don’t you love the mosaic wall too? 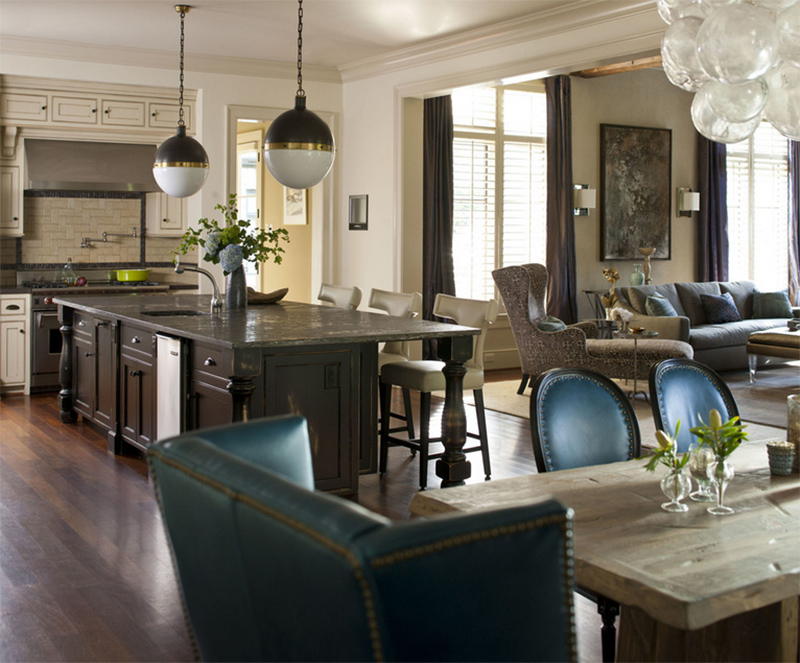 Industrial lightings are used here which somehow complements with the oven, range and other items in the kitchen. Looking very traditional at first glad but if you notice the wine storage and other elements, it actually has a transitional look. 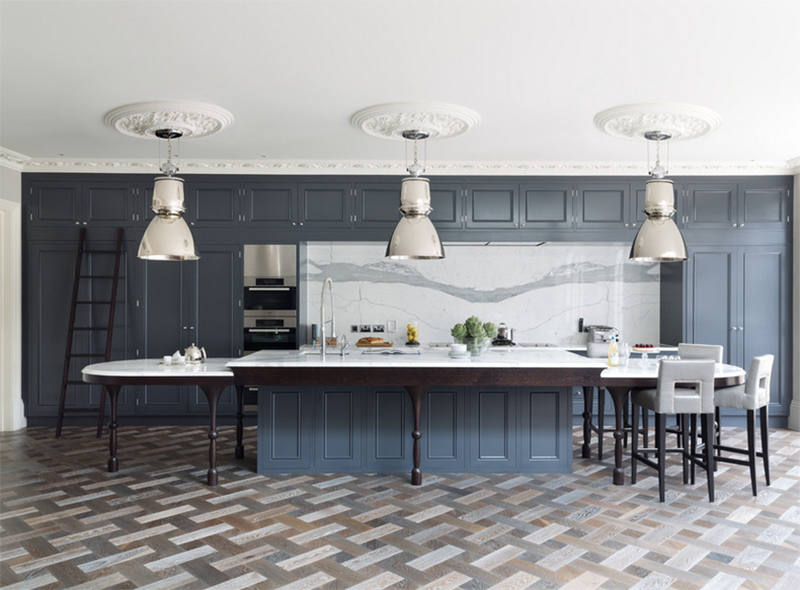 It is easy to spot classic elements in the space but it is actually taken over by this black kitchen island in the middle. 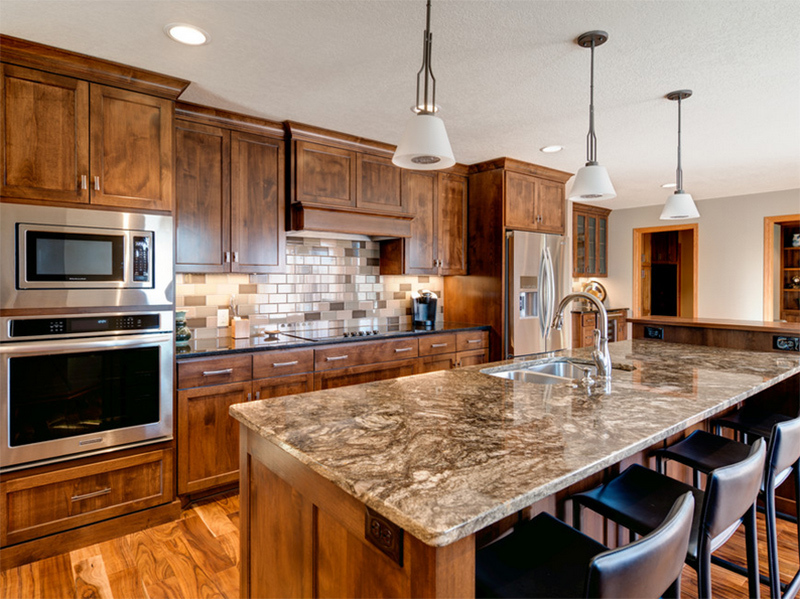 The countertop of the island has an interesting appeal but what makes the look of this kitchen is the wooden cabinets and stainless appliances. I know you have seen the updated classic look on the kitchens above with the addition of contemporary and even modern items into them. We can see that even with its traditional appeal, there would always be something “new” in the space making it a transitional kitchen. 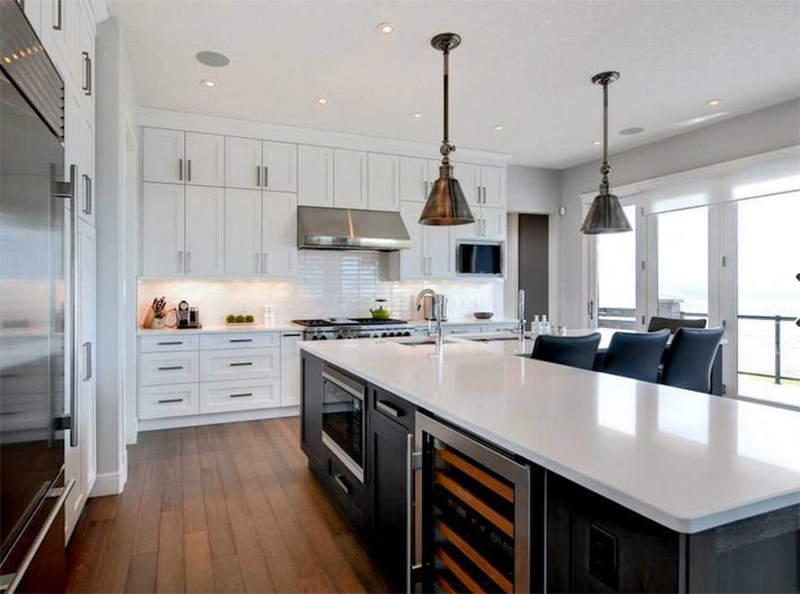 Yes, a transitional look can also be possible in the kitchen too and just on other areas of the house and apparently, with the spaces we have featured, it isn’t that hard to pull off the look. So, if you have a classic kitchen, simply add some contemporary furniture and lighting- then you’ll get a transitional kitchen!